I have ordered from you before but this time the frame came and the acrylic and foam backing was not put in the package and I had to call and get it sent. The customer service was nice and everything else came in a week. Unfortunately I could not get this item to the person who ordered it when promised as you didn't complete the entire order together. Hi G K. Thank you for your review. We are glad to hear that the frame suited your needs and do apologize for the inconvenience on your acrylic kit. Our care teams appreciates the opportunity to help make this right for you. If there is anything else we can do, please let us know. We thank you for your business and hope to continue serving you in the future! MATCHED MY PAINTING VERY NICELY. Similar to another frame also damaged at an outdoor show. I like the design on the frame and the gold color matched the item I was framing. I love the warm gold frame I already purchased from you and know this will be lovely! Will this work on a 16x20 print on canvas Walgreens developed with 1 and 1/2 inch wraparound and backing prepped for wall hanging? Hi Deb. 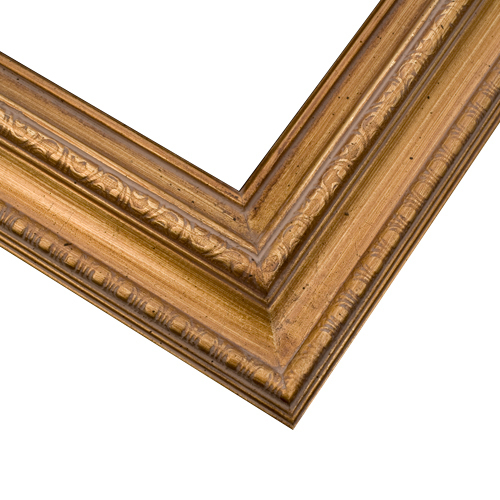 This frame only has a depth of 3/8", therefore, your canvas would exceed the frame significantly. We suggest looking at our canvas floater frames. They have a 1 1/2" depth for a perfect fit to your canvas. My painting is on a 12x16 panel. With foam core backing I just dropped it in appropriate size frame. I would think you would order frame for a 16x20 picture. No the depth of the rabbet is too shallow. Shop for canvas frame depth of 1.5” or it will hang out the back. The American Frame website.